The design of the SP2300 version S216JS with separate body dissociates the working fluid section from the pump: it is specifically designed to convey non contaminated or food grade fluids. Other model : the SP2300 S216 JSN is designed for use in laboratories and cleanrooms. Unlike the S216JS model, the JSN version consumes clean and dry air. The working fluid section is equipped with self-lubricating joints. These pumps can transform a low pressure demineralized water in high pressure fluid through a working fluid (current exemple: breweries). Simply adjusting the air regulator progressively provides the desired pressure. When it is reached, the pump stops and the pressure is maintained in the high pressure circuit without any energy consumption. 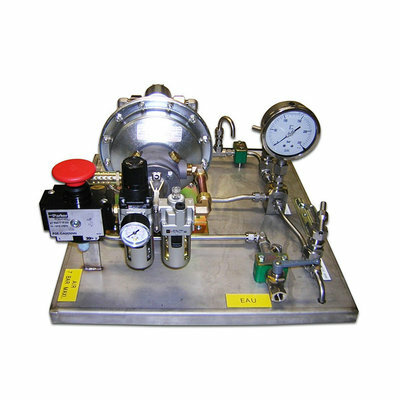 Petrometalic offers this pump mounted on a deck, equipped with both a working fluid line and a pressurized fluid line, ready for use.